Mr. Quiggly Wins Big During the Big Game! Congratulations to Mr. Quiggly who crossed – er, moonwalked across the finish line first in his commercial during last Sunday’s big game. 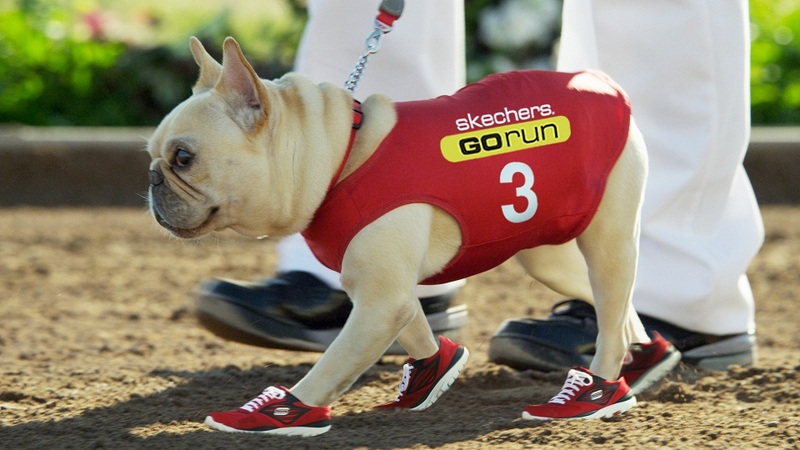 Although French bulldogs aren’t typically known for their speed, Mr. Quiggly had a secret weapon – his SKECHERS GOrun performance footwear. Since his commercial debut, Mr. Quiggly has been winning on and off the track. He has not only achieved more than 500,000 views on YouTube, but he also won 3rd place in the USA Today Facebook Ad Meter Viewer Panel and placed 8th in the People’s Vote! GO Mr. Quiggly! Help Mr. Quiggly and SKECHERS Win the Online Race after the Big Game! Whether you’re tuning in for the game or the ads, check out SKECHERS’ commercial at the two-minute warning of the first half to see the outcome of Mr. Quiggly’s big race. And remember, after you’re done rooting for Mr. Quiggly (and your favorite football team), visit Facebook’s AdMeter, Twitter’s AdScrimmage, YouTube’s AdBlitz or Hulu’s AdZone, and help SKECHERS win the online race for best commercial.